Not too long ago the winning boss designs for Rockman Xover were announced. Today those designs have resurfaced; polished and all pretty thanks to the talents of Capcom's designers. Just look at Arcademan. Is that not spiffy or what? Click here to check out the designs for the runner-ups, Tabletman, "There" and Dharman. I must say, I was indifferent to the original entry, but Arcademan is looking rather spiffy in that official art. It's a shame his potential is being wasted on Xover, but who knows? Maybe he'll show up in a better Megaman game someday. Tabletman is also amazing! Here's hoping that someday, they end up in something else, like Blademan did. 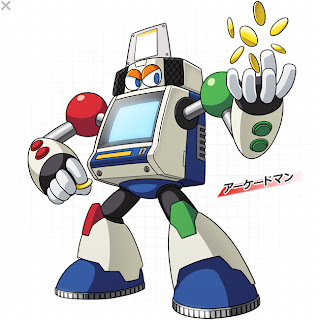 Arcade Man seriously needs to appear in a new Classic series Mega Man game one day. Some pretty spiffy designs in there. Sylveon, Xover is nowhere near as awesome as Wily and Light no Rock Board: That's Paradise. "There" is where it's at. Perfect for the next Rockman X9 game. Arcade Man is perfect for the next Rockman 11 game. ...I honestly don't know how anyone could possibly defend this. Seriously, that piece of garbage makes Mega Man Universe look like a masterpiece, and that's saying a lot, right there. Wow...I don't know about you guys...but I just really, REALLY don't know why you HATE these chosen characters anyways. Is it because you guys couldn't send your own robots to the contest? Hate every designs so badly as hell? No favorites? Or for no reason, like everybody else feels the same way? Xover IS pretty crappy, though. If only the gameplay was... uh, existent. Because there really is a lot of cool characters and designs going into Xover, but the gameplay itself kinda makes it all for naught. It's like I love and hate Xover all at once. I'll admit that Arcade Man's final design is definitely much better looking than the initial entry, which was pretty...not good. I do like this design, though. The 3 runner ups look pretty cool too. Please don't compare unreleased games to released games, it's like saying EarthBound 64 is better than Mother 3 (I know they're technically the same game but whatever). I didn't blindly hate that game. I'm pretty sure I had various, valid reasons for why I disliked it. Alright, point taken. I'll rephrase that, then. As bad as Universe was shaping up to be before its cancellation, and ended up getting released as-is (or was), even that would have been better than Rockman Xover. As a few people have pointed out so far, Xover does have some good ideas here and there, such as the concept of a crossover between all the series in the Mega Man franchise. It's just that many things in the game are executed so poorly (especially the gameplay engine), thus ruining the entire experience. Only thing I've consistently liked about Xover is the theme song. Kalinka's design too, I guess, but that's hardly a large merit. Hell, I have fun playing Xover. It's a free cell phone so i can't really fault the gameplay too harshly. Bedies I think it's more about personally customizing your own "Rockman" thats where the fun comes in. I decided to give the game a try and was surprised how much I enjoy the game.